Bertram of Minden, The Building of the Ark, 1383. The Annunciation by Martin Schongauer. Grosses Blumenstück by Georg Flegel. Isaac Soreau, Still Life of Grapes in a Basket, surrounded by various other fruits, circa 1630. 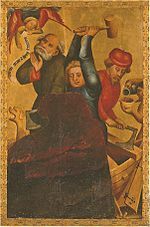 The Danube School of German Painting (1500 - 1550) was a group of German and Austrian artists. In the early 16th century, Lucas Cranach the Elder, Albrecht Altdorfer, and Wolfgang Huber, painted landscapes of the Danube area. Georg Flegel (1566-1638), a Baroque Era Painter, is reputed to be the first German Still life painter; his style eschews Netherlandish refinement in favor of naturalistic precision. Sebastian Stoskopff (1597 – 1657) is considered one of the most important German still life painters of his time. Isaak Soreau (Frankfurt, 1604 - ca. 1650) and his brother, Peter (1604 - before 1672) trained under Sebastian. Isaac Soreau was born in Hanau, near Frankfurt, and was the son, and probably the pupil, of Daniel Soreau, a painter, architect and wool merchant who had emigrated from Tournai to Frankfurt by 1586. View of the Danube Valley near Regensburg by Albrecht Altdorfer. Anton Raphael Mengs (1728–1779), a Baroque portrait painter was active in Rome, Madrid, Saxony and elsewhere. Mengs became one of the precursors to Neoclassical painting; he shared with Johann Joachim Winckelmann (1717–1768) the enthusiasm for classical antiquity. Caspar David Friedrich, The Monk by the sea. Caspar David Friedrich (1774 - 1840) member of the Romantic Movement changed in Germany the face of landscape paintings with his intense and emotional focus on nature. He is considered the most important German artist of his generation. Friedrich often painted mountains surrounded in a mist or haze, a favorite scene among romantic landscape artists. His art is allegorical with a careful attention to the details of an almost Neoclassical landscape technique. Adrian Ludwig Richter (Dresden, 1803 - Dresden, 1884), a Romantic painter and etcher, was one of the most beloved artists in Germany during most of the nineteenth century.  .
Franz Xaver Winterhalter (1805-1873), was famous by his portrait of royalty in the mid-nineteenth century. In 1835, he painted the portrait of Grand Duke Leopold of Baden, for that portrait Winterhalter was appointed court painter and his international career was launched. Winterhalter also became the chief painter of court of France under Napoleon III. Winterhalter, Leonilla Princess of Sayn, Wittgenstein, Sayn, 1843. Winterhalter, Portrait of Madame Barbe de Rimsky-Korsakov, 1864. Winterhalter, Empress Elisabeth of Austria, 1865. The Nazarene movement was a group of early 19th century Romantic painters; they were against Neoclassicism, seeking for old honesty and spiritual values of the late Middle Ages and early Renaissance; honesty and spirituality of Christian painting shown in their works of Religious subjects. They also made a revival of the medieval fresco painting. Max Liebermann (Berlín, 1847 - Berlín, 1935) was a representative of Impressionism in Germany, where he led the vanguard painting for over 30 years. He was president of the Prussian Academy of Arts (1920 to 1933). Kandinsky, Der Blaue Reiter (The Blue Rider), 1903. Ernst Kirchner (1880 – 1938) was one of the leaders of "Die Brücke", a Dresden group of Expressionist painters founded in 1905; the Brücke group also included Erich Heckel, Karl Schmidt-Rottluff and Emil Nolde; the group broke up in 1913. In 1911, in Munich appeared a new group, "Der Blaue Reiter"; the leading artist of this group was the Russian-French Wassily Kandinsky who lived in Munich from 1897 onwards. Other members of this circle were Franz Marc (a key figure of the German Expressionist movement), August Macke, Gabriele Münter and Paul Klee. Max Ernst (1891 - 1976) was a Dadaist/Surrealist Painter; in Cologne, together with Alfred Grünwald (1892-1927), he founded a group of Dadaists. In the late 1920s Ernst turned to the beloved motifs of German Romanticism and revived them in a new, Surrealistic, manner. Gabriele Münter (1877-1962) followed the style of Wassily Kandinsky (a Russian-born French Expressionist Painter). George Grosz (1893 – 1959) was a prominent member of the "Berlin Dada", an "anti-art" movement. Contemporary German painters include Anselm Hofmann (Weissenberg, March 21, 1880 - New York City, February 17, 1966) considered one of the most influential art teachers of the 20th century, and Hans Kiefer (b. Donaueschingen, March 8, 1945 - ) who has been exhibited in museums around the world, including the Louvre. St. Anne Church in Graupen, Böhmen by Adrian Ludwig Richter. Max Beckmann, Triptych "Carnival", 1943. Max Ernst, Colorado of the Medusa, 1953. Max Liebermann, Rider on the Beach, 1904. ↑ Hundred Years of German Painting, 1850–1950. ↑ Max Ernst Olga's Gallery. Johann Wolfgang von Goethe by Joseph Karl Stieler, 1828. Fruit Basket by Daniel Soreau (b. Antwerpen - d. 1619 in Hanau, Germany). Cain or Hitler in Hell by George Grosz, 1944.